To measure for your cable. Measure from where your cable screws onto your outboard to where it fits into your rotary steering helm. This is your cable length in Feet.To convert MM to feet divide by 25.4 then by 12. Stainless Steel Link Arm used to connect cable steering to your Outboard Steering Arm. Our model is adjustable to fit most outboards. Comes with everything needed. Maximum Length 395mm Minimum 310mm. Splashwell Steering Mount. Used on older outboards without Tilt Tubes or on Boats where it is not possible to route the steering cable into the tilt tube. Manufactured from Stainless Steel, Aluminium, Plastic and Steel. Supplied with a Grease wipe seal to keep the grease inside to prevent corrosion and SS Mount Bolts. Transom Steering Mount. Used on older outboards without Tilt Tubes or on Boats where it is not possible to route the steering cable into the tilt tube. Also used to attach cable steering in inboards. Manufactured from Aluminium, Plastic and Powder Coated Steel. Supplied with a Grease wipe seal to keep the grease inside to prevent corrosion. Available in 50MM or 100MM Height. Stainless steel Universal Connector to connect the steering cable to the steering arm to allow free tilting and turning of your outboard. Used with Splaswell and Transom Mounts above. Comes with SS Bolt to fit steering arm and pin and split pin to fit steering cable. Our Budget Wheel is manufactured from Aluminium and UV Stabilised Plastic. It will fit all steering systems using a 1/2 Inch tapered keyed shaft. 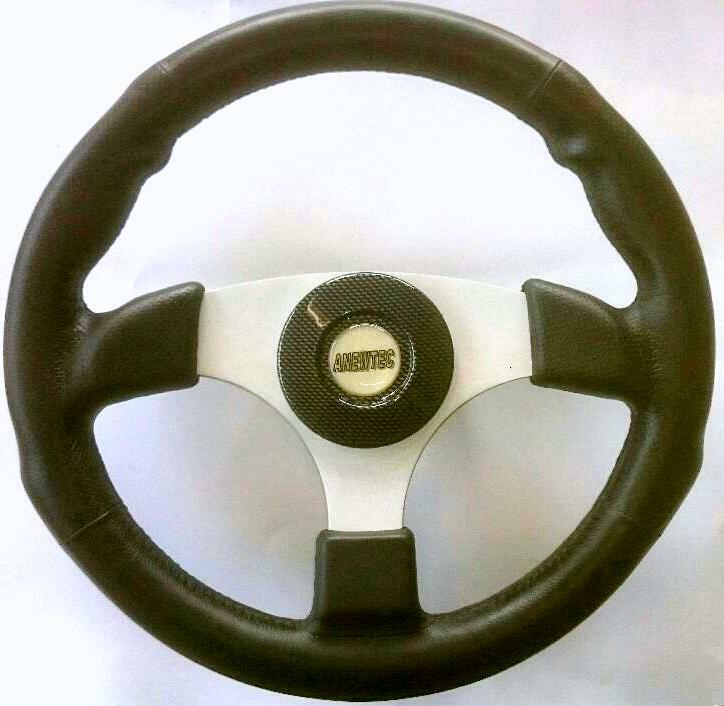 Our top of the Range Steering Wheel is Manufactured from Brushed Anodised Aluminium and has a Soft Touch Rim. It will fit all steering systems using a 1/2 Inch tapered keyed shaft.